Home &gg; Blog &gg; General &gg; What Happens When You Combine Analytics and Pregnancy? Those of who know me might have noticed I have been suspiciously quiet. (Let’s be honest, that’s not the norm for me!) I wanted to explain a little about where I’ve been, and how I manage to make everything in my life about analytics. If it wasn’t obvious from some of my previous posts and presentations, I have an interest in “quantified self” – essentially, tracking and applying analytics to every day life. So, when my partner and I were expecting a baby, of course I had to turn this in to an opportunity to analyze what happens to physical activity levels during pregnancy. As background: I’m a pretty active person. I teach Les Mills group fitness classes (4-5 classes/week) and work out 6-7 days a week. 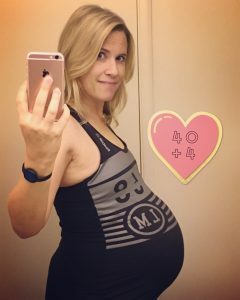 Because I was so active before pregnancy, I was able to keep doing everything I had been doing, all the way up until the day I went in to labor. However, even with a focus on continued activity, I found there was still a “slow down” that happens in pregnancy. I tracked my steps and “active time” (which includes any exercise, even if it’s not “steps based” – for example, this would include activities like swimming or yoga, that aren’t easily measured by “steps”) throughout pregnancy, as well as during the postpartum period. This gave me data I could use to examine the changes to activity levels at different stages of pregnancy, and after birth. Pregnancy definitely decreased my average daily step count, with the heaviest “hit” to my steps occurring in the third trimester. The first trimester wasn’t a huge change. I was still taking 11,000 steps a day! (A -19% drop.) However, I was pretty lucky. I had an easy first trimester with no nausea. A lot of women are actually very inactive during the first trimester due to exhaustion and morning sickness. The first five weeks after birth drove most of this, with only 3,400 steps/day. While my steps decreased -37% in pregnancy, my active time only decreased -26%. So, I was keeping active, just in other ways. During the first trimester I was still managing an average of 2 hours of active time per day! This dropped to 1.7 hours in the second trimester, and 1.5 hours in the third. Similar to steps, the biggest drop was in the post-partum period, where I averaged only 1.2 hours of active time per day (a -48% drop.) The lowest of this was during Weeks 1-5 (only 0.7 hours/day), with 6 weeks post-partum seeing an increase in activity again – up to 1.8 hours/day and climbing! For years now I have used Jawbone UP products to record my step, activity and sleep data. I have IFTTT connected, which automatically sends my UP data to a Google Spreadsheet. That’s the data I used for this analysis. Let’s be honest: Seeing how little sleep I’m getting, or how fragmented it is, would be a totally bummer. My partner is pretty awesome about sharing night duty 50/50, so I choose to not look to closely at my sleep, since I know it’s actually pretty darn good for a new parent! Yes, there is actually such a thing as a Quantified Baby. 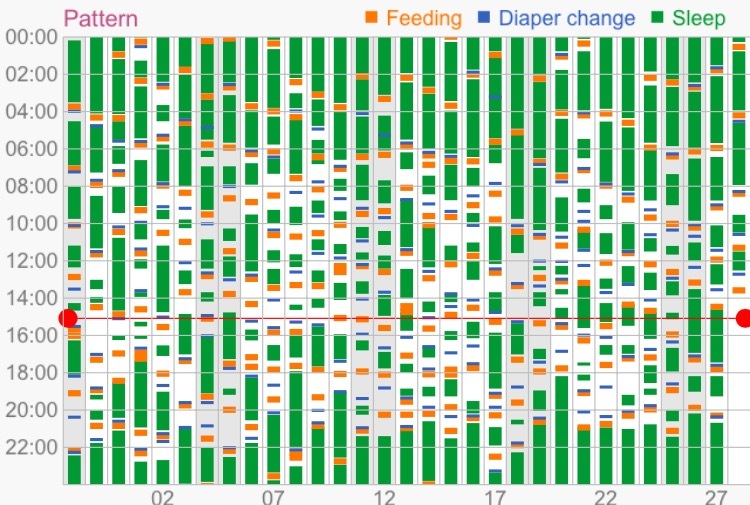 My partner and I use the Baby Tracker app to record our son’s sleep, feeds, medication etc, which gives us amazing little charts we can use to detect patterns and respond accordingly. For example, choosing an appropriate bed time based on the data of his sleep cycles. There’s probably not a post coming out of that, but yes, the tracking does continue on! I undertook this analysis mainly because I found it interesting (and I’m a nerd, and it’s what I do.) Pregnancy was such a unique experience, I wanted some way to quantify and understand the changes that take place. Most people probably won’t be too interested, but if you have any questions or want to discuss, please don’t hesitate to leave me a note in the comments! Ok, I’m a nerd too but I found this very cool! It resonates with me because I’ve been experimenting with using the personal trackers for the past year or so. I started with Fitbit HR but they’re not well made – I had 1 of them drop to bits on me and its (free) replacement required a daily charge, then I moved to Withings but the glass cracked and have now settled on the Finnish Polar A360 which is pretty good. I like the IFTTT approach to get the data to Google. I’ll have to see if I can do that with Polar and add the previous data to it.